Author: Simpson, M.J. Set In . . .
Pocket Essentials is a dynamic series of books that are concise, lively, and easy to read. Packed with facts as well as expert opinions, each book has all the key information you need to know about such popular topics as film, television, cult fiction, history, and more. 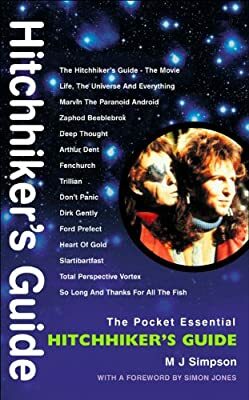 The Hitchhiker's Guide to the Galaxy is a unique phenomenon which started life as a radio series in 1978 and was subsequently adapted into five best-selling novels, remade as a BAFTA-winning TV series, re-recorded as a chart LP, reinvented as a computer game, dramatized for the West End stage, and translated into more than 30 languages. For the first time, the full story is told in all its bizarre detail. Every variant of the story, every spin-off and cash-in is documented in context, the contradictory storylines are explained, the background to the many adaptations are chronicled, and the success of the different versions is analyzed. Based on 20 years of research, it includes an interviews with Douglas Adams.